If you are looking for a review of all the best rotary washing lines in the UK, you have found the right place. We review all the latest and best rotary washing line models on the market, to give you peace of mind that you will be choosing the right product for your home. Below, in the table, the rotary washing line reviews start with the most highly rated first, then descend accordingly. For people who are in a hurry, you can use the table. For people who want a more in-depth review, you can scroll further down the page, where we provide all the pro's and con's for each. What Are Rotary Clothes Lines? You can keep the lines clean and compact when not in use, the unit folds in easily. It has an easy-open pull-cord and deluxe easy closing push-button to make opening and closing effortless. There are eight hooks to hang delicate clothes. The lightweight aluminium frame doesn’t rust and is portable. Manufactured in Germany, it comes with a ground socket and a hefty three-year guarantee. There is a three-year guarantee. The Brabantia Lift-O-Matric Rotary Airer is a relatively low cost steel rotary dryer. It is available in three sizes: 40m, 50m, and 60m. Purchase options include accessories and a cover. The Brabantia washing line system can be adjusted to an optimal working height between 129 to 187cm. There is a substantial 50m of drying space. The four arms have small holes that allow you to hang clothes hangers with more delicate pieces of laundry. Brabantia rotary airer has a generous five-year guarantee. Furthermore, they have partnered with WeForest to plant a tree every time a laundry tree is sold. To store it, you can lift up the body from the ground spike and stow it away. The manufacturer offers a five-year guarantee. You can adjust height to a comfortable level. The company works to plant a tree in conjunction with a purchase. This model doesn’t have foot pedal or one-handed operation. Initial installation can be tricky. The Home Laundry Company's Premium Rotary Washing Line is a low-cost rotary clothes dryer available for purchase in the UK. The 40 metre drying area can easily accommodate a family’s laundry within a small space. The centre pole is made of premium quality steel. The clothes line is made of PVC-coated polyester.It utilises a locking system to give you four different line tension settings. The purchase includes a cover and ground spike. It includes a cover and ground spike. The steel core is durable and weather-resistant. There is limited shipping availability due to the size of the product. 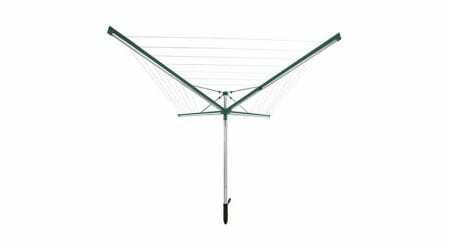 ​The Livivo Heavy Duty Rotary Garden Washing Line is a reasonably priced model of rotary airer available for purchase in the UK. It provides 45 metres of drying space, enough for four loads of laundry. The line is coated with PVC. The heavy-duty, powder coated steel is strong, able to stand up to harsh weather and the elements. It’s lightweight and easy to install. High capacity within a small space. T﻿he Addis 4-Arm Rotary Airer comes in variable sizes: 35m, 40m, 45m, and 50m. Additionally, the buyer can choose from 3-arm and 4-arm styles. Here, we are reviewing the 40 metre, 4-arm model. The rotary airer allows you adjust the tension level on the unit. The grey coloured painted steel frame has a turning circle of 2.47 metres and a maximum height of 1.75 metres. It weighs 4.2 Kg. When it is not in use, it can be folded down and secured with the provided Velcro strap. The user manual is available for viewing on the purchase website. The manufacturer provides specific directions for installation of the rotary airer in the ground or in concrete. The maximum load is 25 Kg. Foldable design allows you to reclaim valuable area. It has rust and weather-resistant construction. The lightweight material can be prone to bending/twisting. ​FunkyBuys Heavy Duty Outdoor Rotary Clothes Airer is a reasonably inexpensive rotary drying line. It comes with a ground spike and cover, free of charge. The heavy-duty model is made of powder-coated steel. The line is PVC-coated for strength. This 50-metre model supports more heavy, wet laundry. It has four arms that are able to easily accommodate up to four loads of laundry. This is a foldable model that can be removed and stowed, saving valuable yard space. Installation and tension-adjustment can be difficult. ​The Marko Homewares 4 Arm Rotary Airer Clothes Dryer is inexpensive, yet still manages to maintain a 40-metre hanging space. It is 1.75 metres. The washing airer is PVC coated for strength. This rotary airer comes with a cover and ground spike for solid installation. A useful feature is that this rotary airer can be folded down when not in use. The cost of this rotary airer is very affordable. Users report that it is well-made and durable. Users complain that the airer is difficult to manipulate. Kingfisher's Rotary Clothes Airer is a large-capacity 50-metre line. The rotary airer is available at a low cost on Amazon. The heavy-duty, powder-coated design is made to last. A plastic ground socket makes installation easy. The line is PVC-coated for strength. It can be readily stored and assembled. It is lightweight to the point that it may compromise strength. Manufactured by Kingfisher, a respected retailer in ten European countries. Have been known to be flimsy compared to the higher rated models above. ​The Minky Free-Standing Rotary Airer is a low-cost, attractive outdoor airer. It comes in a grey colour, with blue accents. This particular model is suitable to use either outdoors or indoors, without the need to fix or drill the unit into the ground which would commit you to one single location. The lightweight unit stands on a tripod with hooks that hold onto the ground during windy weather. Of course, the hooks cannot attach to all types of surfaces. This type of airer is perfect for travelling and small spaces, folding up compactly when not in use. It has weatherproof construction. The line space is limited, 15 metres, so you may want to space out your laundry for its limited capacity. Can be used in many locations. May not be as firmly stable as other models. Rotary airers/clothes lines are an economical, Earth-friendly option for drying clothes. The added benefit to your pocketbook comes in the form of preservation of your clothes. Clothes that are dried in fresh air wear out at a slower rate and are naturally sanitised without the need for chemicals. This means that you don’t need to spend extra money to run your dryer, replace worn out clothing, and buy extraneous products that are used in the dryer. Rotary clothes lines are a huge-improvement on traditional end-to-end clothes lines because they are able to use a small space for a large amount of laundry. Of the models we’ve reviewed, the best clothes airer would be the Leifheit Linomatic Rotary Washing Line. The 60-metre clothes line capacity is enough to support four loads of laundry. It is strong-bodied and weather-resistant. It also folds up for storage. A rotary clothes line is just one type of air-drying mechanism. There are several methods of drying clothes outside that range from informal strings stretched between two posts to large racks and contraptions. All of these methods work in the same way: allowing contact between your clothes and the sun’s rays in order to dry them. If you are setting up a simple rope-type clothesline, consider a material that will hold over time, not fray, and not sag. For convenience, you can use a retractable clothesline that can be rolled up and put away when not in use. Folding frame clotheslines offer the same flexibility—being stowed in an upright, out of the way position–however they require initial installation into a wall surface. T-post clotheslines consist of several drying lines strung between two T-shaped beams. This secured version is strong and can stand up to weather and heavy usage. You can also use a drying rack or clotheshorse and dry clothes inside when conditions do not permit outside drying. Reasons why you may need to dry clothes indoors include, but are not limited to, inclement weather, community rules barring hanging, theft, and environmental contaminants. However, if you are able to use the sun’s heat energy, it would be the most desirable tactic. A rotary clothes line is also known as an umbrella clothesline or a Hills Hoist. It is a height-adjustable compact clothes line that exposes the maximum area of clothes to the air as the clothesline rotates to dry the clothes.This type of clothes line represents a more efficient way of air-drying clothes, as compared to a traditional rope clothes line stretched between two points. The rotary clothes line is perfect to use in areas with adequate space. Furthermore, some models can be folded down when not in use. The design of the rotary clothes line allows the device to rotate. Spokes or arms (usually four) extend from a single pole that’s been secured in the ground. Made of galvanised wire and aluminium, these are strong and large fixtures. These were very popular a generation ago, but still are commonly seen in peoples’ yards. The spider web-like design creates larger hanging spaces on the exterior which decrease in size as you reach the middle. Newer rotary clotheslines can capture the power of sunlight via solar panels, and use it to spin the clothesline. This is a clean, renewable form of energy that costs nothing to the consumer. The sun’s radiant solar energy is able to rotate the clothesline, resulting in more efficient drying without any external energy input or force. This is excellent solution for places with sun exposure but limited air movement. Many people are returning to a passive way of drying clothes—with the power of sunshine outside. Not only does this save considerable energy, it saves moneyby not having to run the dryer. The average load of laundry in the dryer takes up $0.36 (USD). While this is wholly unsubstantial per load, if you do laundry regularly, it can end up costing you a considerable amount of money over time, without consideration of the products you use in the dryer. If you take the attitude that every bit of savings is helpful, you’re a great candidate for air drying. People often prefer machine drying because of its ability to sanitise clothes. Fortunately, not only is sunlight is powerful and effective at drying clothes, it can naturally disinfect and whiten clothes. It does this without the need for using heavily scented and irritating detergents and bleach. More so, it can help you get rid of musty smells in fabrics. It can also keep your clothes in good condition for longer as they are not subject to the harshness of a dryer. Clothes with elastic will remain intact for much longer when they’re dried in the sun. Organisations that fight for the well-being of the planet by supporting energy conservation and emission reductions cite Pew Research that suggests more and more people are considering clothes dryers to be a luxury. Given their non-critical nature, we grow reluctant to rely on these luxuries that promote the expansion of environmentally devastating, dirty fossil-fuel plants. Rather, we are urged to reduce our own wastage and decrease our individual carbon footprints. Air drying results in zero greenhouse gas emissions per load, as compared to 2kg of greenhouse gas emissions per load of a normal, mechanical dryer. As you can imagine, repair and replacement costs are also much lower. Created in Adelaide, Australia, the Hills Hoist was a near ubiquitous fixture in Australia’s and New Zealand’s backyards, so much so that The Hills Hoist has earned a cherished, iconic place in their cultures. This brand-name product has become synonymous with any rotary clothes lines. Lance Hill began manufacturing the Hills Hoist in 1945. The inventors, Stewart and Harley, submitted the idea for this unique rack in 1895. However, a man named Gilbert Toyne worked on multiple similar designs, and today his 1925 model is the one that is so recognisable. These structures are lauded for their indestructible nature, a common reference being that they survived when nothing else did after a major storm in Australia. Essentially, there are two types of rotary clothes lines: fixed and folding. As the name suggests, a folding rotary clothes line allows you to fold up the arms and remove the structure from the ground. This version can be stowed when not in use. The fixed rotary clothes lines, like the Hills Hoist, are made of galvanised steel and steel wire. They’re usually cemented permanently into the ground. Generally, these are massive structures so you may want to ascertain what your space constraints are in the intended location. Further, you should consider how much laundry you have to dry regularly and how often. Sparse requirements may not justify the installation of a rotary clothes line, particularly a fixed model. You will want to carefully consider your normal laundering needs when searching for a rotary clothesline. Do you wash bulky bedding and oversized items often? Are your clothes thick and difficult to dry? If you do laundry daily, it may be completely worthwhile to choose a permanent, stronger clothesline as you will be testing its strength consistently. On the other hand, if you are a light user, a smaller portable/removable version would meet your needs and retain your space for other purposes. Weather and local conditions around you may also influence your decision. If there are many aggressive storms in your area, you would probably fare better to get a better-quality device upfront, rather than paying for multiple broken clotheslines and/or parts. In more polluted and sandy areas, allowing your clean, wet clothes to pick up all the ambient dust particles would certainly be counterproductive and so indoor drying would be more logical.